The Marshall upgrade is implemented on all flying C-130s in the SAAF fleet. 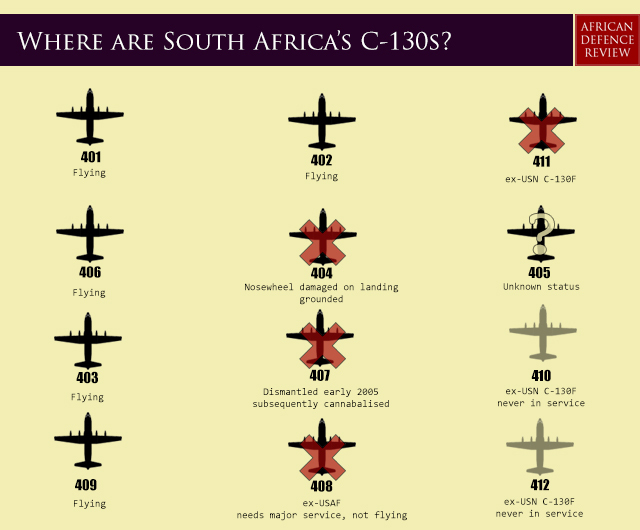 With the SAAF C-130 fleet celebrating 50 years of service in 2013, the need for replacements is dire. That said, however, the Marshall upgrade should get the current fleet operating into 2020 at the least, and 2030 at an absolute stretch. Thankfully, however, the C130s have been under-used during the past five decades, averaging roughly 17000 flight hours per machine, which is well below their American counterparts. This means that the aircraft are not exactly high mileage airframes so much as under-used systems that can be stretched another ten years. If the South African Military is going to continue its ramping up of expeditions abroad, however, defence planners may well find that the 28 Squadron air force will be in need of new aircraft quicker than 2020.